BSNL Unlimited 4G Offer- Get 56 GB Data for 28 Day Only at Rs 339. 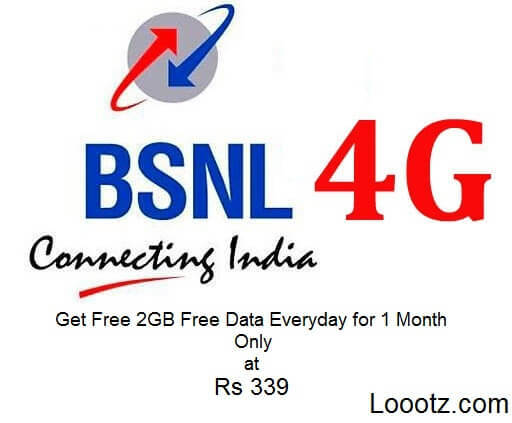 BSNL Offers 2GB 4G Data Every day Only at Rs 339. BSNL wants to Grip hard in Telecom Industry. So, The User does not go to the Other Telecom Cellulars. In this Offer, BSNL gives you 2GB 4G data per Day with Unlimited Calls within their Network, wherever You want to call in India. The Unlimited Data and Calls are valid to 28 Days. For the Other networks, You will get 25 Mins Per day for free. The Users of RJIO increasing every day just because of Free Unlimited 4G Internet and Unlimited Calls. Now, Jio already announced the New Summer Surprise Offer for Jio Prime Users, Who wish to continue to use the Offer same as Jio Happy New Year Offer. If you want to enjoy free unlimited services In Jio then you've got to pay Rs 402(Rs99+Rs303) for 3 Months. While the other cellular networks are giving a very attractive offer to pull over to their Network. Vodafone giving Unlimited 4G Data and Unlimited Calling at Rs 349. For Idea, The same offer costs you Rs 345. Airtel also giving same offer as Vodafone and Idea. If you want to know more details about this offer then you can go to the BSNL Care or Dial 1509(BSNL Care Number). BSNL Also Introduce New Offers for the Landline Customers. Here are the Two Key / Main Offers.